Standard version of our Titanium Seatpost - the effective length of the seatpost are similar to Brompton's standard seatpost - this is compared to when the Pentaclip is in it's highest position. We have strived to design a lightweight, yet solid seatpost, with a beautiful and clean look. Brompfications Titanium Seatpost feature the familiar setup with two yokes that clamp the saddle rails in a half circle cradle. This is not only an elegant solution, but also save a lot of weight compared to Brompton's Pentaclip solution. 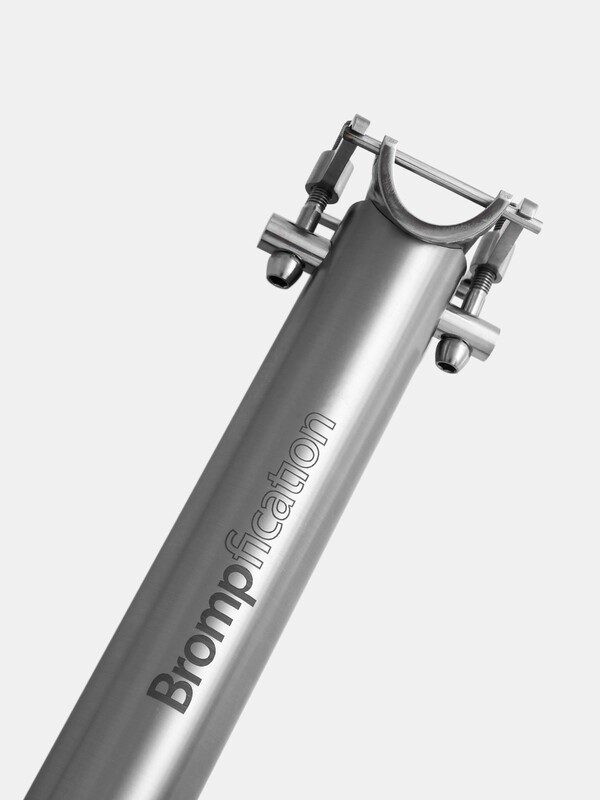 The seatpost is flared at the bottom, like the original Brompton seatpost. Titanium is one of the best materials for seatposts because of its ability to deflect shock, and increase riding comfort. Unlike most other titanium seatposts, all parts on our seatpost are made in titanium - not only the post and the bolts, but also yokes, connecting rod and cradle are made from titanium grade 5. The seatpost are 185 grams lighter than Brompton's standard steel seatpost and Pentaclip, and 75 grams lighter than Brompton's now discontinued titanium seatpost. Recommended rider weight limit of 100 kg. Recommended maximum rail clamp torque of 5 Nm.